Almost all English medieval church silver was melted down during the Dissolution of the Monasteries. This beautiful censer is a unique survival; its design is similar to that of a Gothic building. It was discovered in 1850 in Whittlesea Mere, Huntingdonshire, which was being drained for conversion to farmland. It is not known whether the censer had been deliberately hidden in the mere during the Dissolution, or whether it had been lost there at some earlier date in a boat accident. The censer was a standard item of church metalwork, and was used in various ceremonies, such as the mass, processions and the performance of the last rites. Incense was placed on hot coals inside the censer. When the censer was swung on its chains, it gave off aromatic smoke. Silver gilt, with plain silver chains. A circular bowl on spreading foot, surmounted by a six sided tower of openwork tracery of architectural design terminating in a pyramidal roof with finial. The three chains for suspension are attached to a cap in the form of a conjoined triangle and trefoil with a trefoil loop and ring handle. A fourth chain , for raising the cover of the censer passes through the hole in the cap. The foot is pierced with a border of quatrefoils; the bowl is surmounted by a ruin with embattled edge and a border of pierced trefoils. The tower consists of gabled windows of decorated tracery alternating with groups of lancets surmounted by window-heads set back from the embattled parapets. The roof rises from a similar parapet, it is engraved with chevron pattern and terminals in a finial ornamented with leaves. Found with the incense boat (M.269-1923) and a group of articles in pewter and pottery, in the bed of Whittlesea Mere, Huntingdonshire, in 1850, at the time of its draining, by James and Frank Coles. 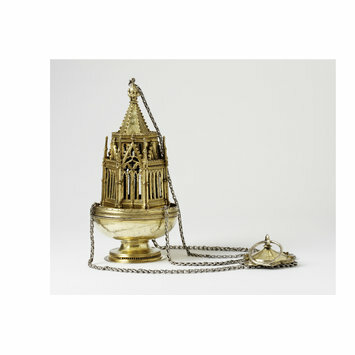 The censer is of the highest quality, and would have belonged to a wealthy church or abbey. The incense boat with which it was found is decorated with rams' heads, which is almost certainly a rebus (i.e. a punning symbol) for 'Ramsey'. It has therefore been assumed that censer and incense boat were once the property of the nearby Benedictine abbey of that name (7 or 8 miles away). It is possible that the hoard of objects was hidden in the mere during the Dissolution of the monasteries, although Ramsey Abbey seems to have accepted being dissolved quite amicably: in 1538, Richard Cromwell wrote to his uncle Thomas that both abbot and convent were 'conformable to everything that shall be at this time put in ure'. All the monks received comfortable pensions for their trouble. The alternative explanation for the discovery of the hoard in the mere is that it was lost, probably during a boat accident, some time before the Dissolution. Historical significance: This is the finest surviving piece of English gothic ecclesiastical metalwork. 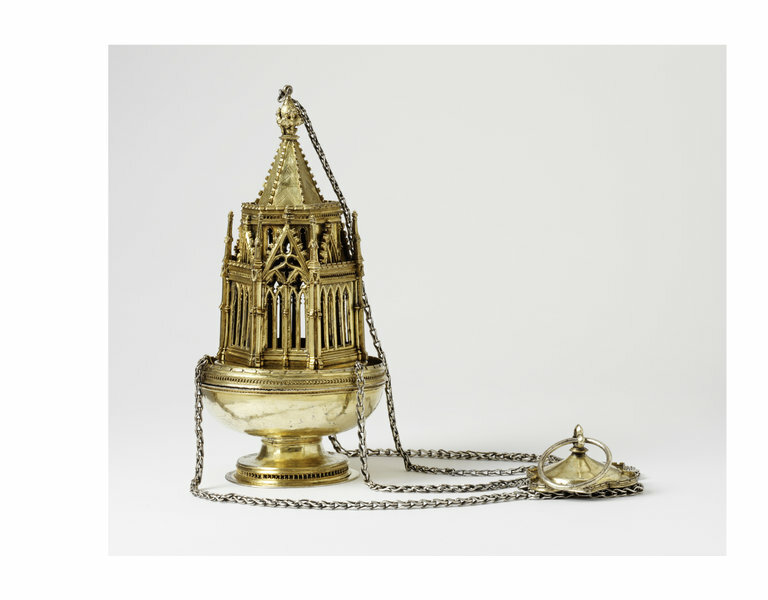 Until the discovery of the Cambridge censer (also at the V&A), it was the only known English gothic censer. Stylistic and decorative differences between this piece and the incense boat with which it was found indicate that the two pieces were not made as a pair. 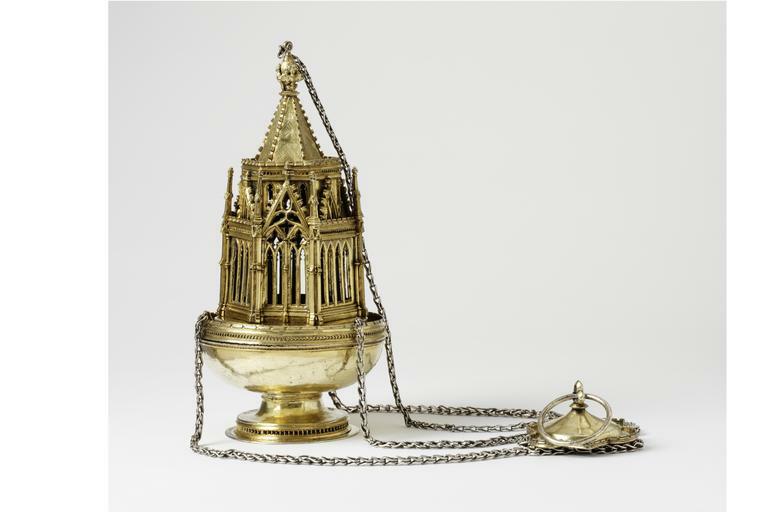 The censer was a standard item of liturgical metalwork, and was used in various ceremonies, such as the mass, processions, blessings and the performance of the last rites. Incense was placed on hot coals inside the censer. When the censer was swung on its chains, aromatic smoke was given off. Church writers occasionally interpreted the form of the censer symbolically. For example, in the thirteenth century, Pope Innocent III declared that 'For as the censer is joined in its upper and lower parts by three chains, so three things are joined in Christ, in whom divinity and humanity are joined - the union of body and spirit; the union of divinity to body; and the union of divinity to spirit. But they also indicate a fourth union, that is of divinity to the composite of spirit and body at the same time: for the censer has four chains' (excerpt from the text 'De sacro altaris mysterio'). The fact that censers often took the form of church-like buildings, as here, only made such interpretations more attractive to ecclesiastics. The gift of Mr. C. W. Dyson Perrins, F.S.A, supplemented by a contribution from the purchase-grant of the Museum. The attribution to England is based on the provenance of the piece, and on certain stylistic features: the 'cinquefoil' heads to the lights, the trefoil leaves of the finial (also visible on the Swan mazer and King John cup). These elements of decoration are assumed to have developed first in architecture, where similar tracery patterns can be seen in a number of English buildings of the early fourteenth century. The abundant crenellations, for example, can be paralleled in the Octagon of Ely Cathedral.